On this episode, learn how to design your space for entertaining, tour the Grand Hellman-Heller Mashion, and more. Tune in! 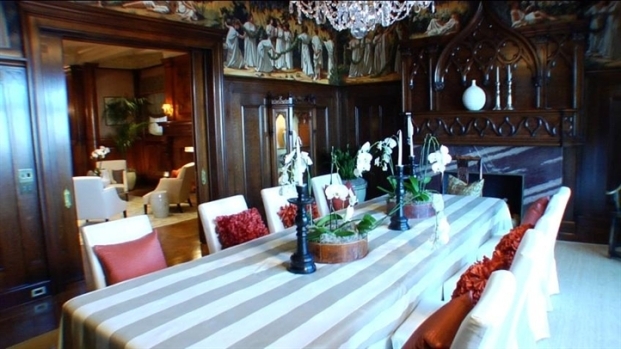 Ramsey Jay Prince of Ramsey Jay Prince Designs invites us inside one his clients' homes and offers up some easy solutions for creating a sophisticated fun space when you entertain at home. Watch now. Coldwell Banker broker Clark Johnson takes us inside one of the most elegant homes in all of San Francisco, the $20 million Grand Hellman-Heller Estate. Watch above. Bennett and his wife Judie have been at the helm of their own Philadelphia-based interior design company for decades. Now, Bennett takes us inside their classically chic uptown NYC apartment to show us some really impressive interior design. Watch now. The Price Collier Estate is a beautiful brick Georgian built circa 1900. It has 10 bedrooms, 12 fireplaces, and incredible lake views. Watch now. This week's rescue brings us to North Minneapolis, Minnesota to Sojourner Truth Academy, a K-8 public charter school that was severely damaged by a tornado. Jenna Bush Hager joins George and his crew of handymen to rebuild a new cafeteria for the kids. Watch now. Coldwell Banker broker Clark Johnson takes us inside one of the most elegant homes in all of San Francisco, the $20 million Grand Hellman-Heller Estate in the well-to-do neighborhood of Pacific Heights. Built in 1902 as a wedding gift for a Wells Fargo executive's daughter, the four-story Classic Revival home has beautiful historical architectural details true to the period. For more information on the Grand Hellman-Heller Mansion please contact Coldwell Banker broker Clark Johnson at 925.683.4024. View the listing. Promotional consideration provided by Coldwell Banker. This article is sponsored content and does not reflect the opinions of NBC Local News. This episode of Open House was hosted from 160 W 86th St, New York, NY For more information on this property please contact Lisa Lippman and Scott More of Brown Harris Stevens at 212-588-5606 and 212-588-5608.